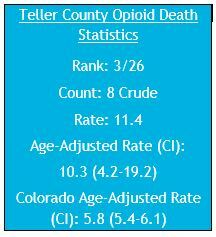 This profile summarizes controlled substance prescriptions that Teller County residents received from 20142016, prescribing practices and patient behaviors, population-level healthcare encounters and deaths related to opioid overdose among Teller County residents. This information is from several sources: The Colorado Prescription Drug Monitoring Program (PDMP), emergency department visit and hospital discharge databases and death certificates. In 2014, Colorado legislators passed a bill that aligned Colorado’s PDMP with best practice strategies2, such as mandating registration for prescribers and pharmacies, daily reporting by pharmacies for dispensed controlled substances, allowing prescribers to delegate access to PDMP records and allowing the Colorado Department of Public Health and Environment to access PDMP data to provide population-level results. 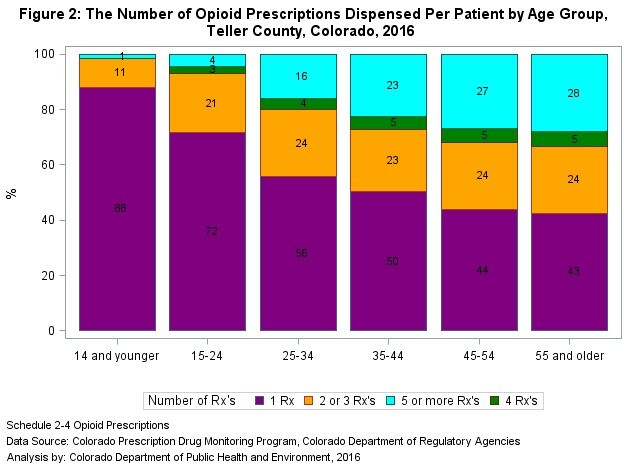 In compliance with this legislation, this report describes population-level data on the prescribing and dispensing of controlled substances, with a focus on opioid prescriptions (also known as opioid analgesics or pharmaceutical opioids), from the Colorado PDMP for Teller County residents. opioids, benzodiazepines, stimulants, sedatives and muscle relaxants. 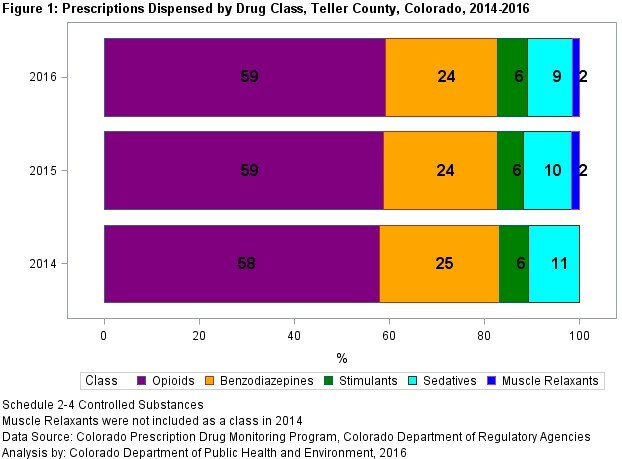 Figure 1 illustrates the amount of schedule 2-4 controlled substances by drug class dispensed to Teller County residents from 2014-2016. Opioids represented a majority of prescriptions dispensed, and benzodiazepines represented a quarter of prescriptions. The percentage of sedative prescriptions decreased in the three-year period. The attributes related to controlled substances differ greatly for each county due to variation in prescribing and dispensing practices within the state. Figure 2 describes the number of opioid prescriptions per patient, by age group. In 2016, the number of prescriptions per recipient ranged from 1 to 104 (median=2.0; mean=4.1) and the number of opioid prescriptions per patient increased with age. The information on controlled substances in the PDMP is useful in identifying prescribing practices and patient behaviors that can increase risk for overdose. 2,4 According to the CDC, potential risk factors for prescription drug misuse include high-dose prescribing, multiple provider episodes, long duration opioids, and overlapping opioid and benzodiazepine prescriptions.4 Understanding these risk factors may help providers better assist their patients in pain management while also protecting their health and safety. These measures are provided in Table 3 and explained in further detail on the following page. Morphine is considered the standard measure for managing pain and is therefore used as a reference for calculating opioid prescription doses. Higher dosages are associated with an increased risk of opioid use disorder and overdose.4,5 In 2014, the Colorado Quad-Regulator Boards of Dental, Medical, Nursing, and Pharmacy suggested limiting dosages to less than 120 mg morphine equivalents (MME) per day to reduce negative outcomes5, and in 2016, the Center for Disease Control and Prevention’s (CDC) prescribing guidelines recommended opioid dosages should not exceed 90 MME per day.6 Although there is variability regarding safe dosage thresholds, assessing dosage can help to identify problematic prescribing practices and patients who may be at risk for substance use disorders. The use of multiple prescribers and pharmacies is associated with high risk drug-related behaviors and adverse events. The number of prescribers and pharmacies a patient visits is often used as a proxy measure for “doctor shopping”. 4,6 The CDC definition was used for this report which defines MPE as receiving opioid prescriptions from five or more prescribers and pharmacies in a six-month period. Prescriptions Both benzodiazepines and opioids are central nervous system depressants that can compromise the respiratory system. Benzodiazepines enhance the effects of opioids so the concurrent use of benzodiazepines and opioids can increase the risk of adverse events.4,6,7 This indicator measures the duration of overlapping prescriptions. Longer duration of overlapping prescriptions may raise concerns of the potential drug interactions and resulting side effects. 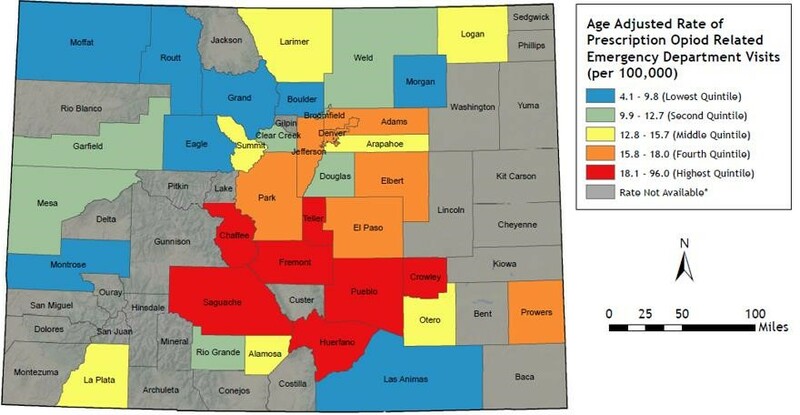 From 2012-2014, Coloradans made 2,404 visits per year to ED’s related to prescription opioid poisoning.9 Throughout the state, ED visit rates per 100,000 county residents ranged from 4.1 in Routt County to 96 in Huerfano County (Figure 4). 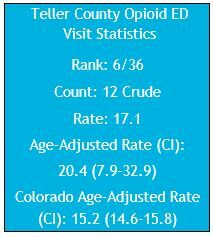 In Teller County from 2012-2014, there were 12 ED visits involving prescription opioids. Of the 64 Colorado counties, 28 were suppressed due to small sample sizes. 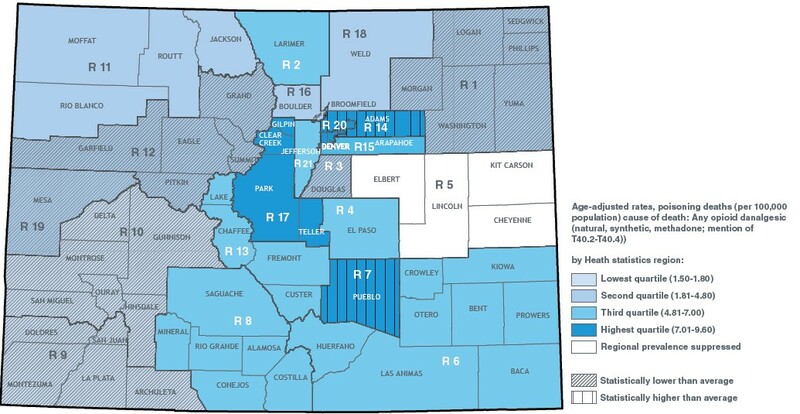 Teller County had the sixth highest ED visit rate in the state. In 2013, 21 percent of the drug poisoning hospitalizations in Colorado were related to prescription opioid poisoning.9 Figure 5 shows hospitalization rates involving prescription opioid poisonings from 2012-2014. In Colorado, opioid related hospitalization rates per 100,000 county residents ranged from 5.1 in Clear Creek County to 59.7 in Huerfano County. 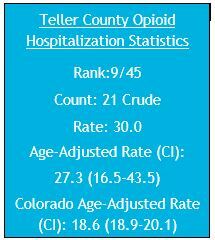 Teller County experienced 21 hospitalization visits related to prescription opioids in the three-year period. 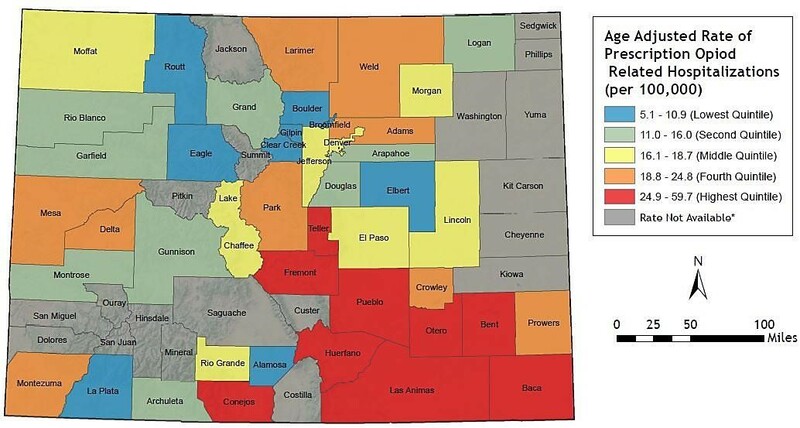 Excluding the 19 counties where data were suppressed, Teller County had the ninth highest rate. 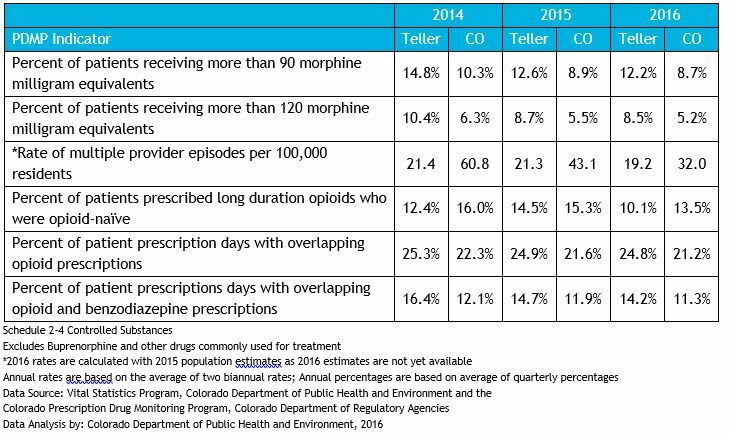 Figures 6 and 7 describe prescription opioid mortality rates in Colorado from 2013-2015. Opioid mortality rates in the state ranged from 2.7 per 100,000 in Park County to 13.5 per 100,000 in Las Animas County (Figure 6). Teller had the third highest death rate in the state. The prevalence of heroin, an illicit opiate, is also increasingly prevalent in Colorado. As heroin use increases, so do the adverse effects associated with heroin use and addiction. The rate of heroin related deaths has increased from 0.8 deaths per 100,000 in 2000 to 2.9 per 100,000 in 2015. 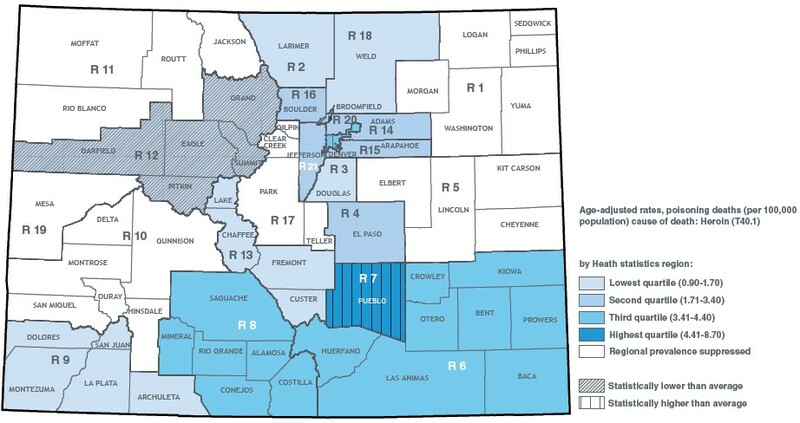 According to the Denver Metro Treatment Client Survey, 70 percent of survey respondents reported that prescription painkillers played a role in their decision to use heroin.10 Figure 8 shows heroin related mortality rates in Colorado by Health Statistics Region from 2013 to 2015 8. Data in this report should be interpreted with caution for several reasons. First, the accuracy of the indicators based on PDMP data is limited by the completeness and quality of the data when entered into the system. Another limitation of using the PDMP for population-level analyses is that it does not include provider type or information on the patient’s medical condition. In addition, the indicators do not capture whether the dispensed medications were taken as prescribed or taken by the prescribed patient. This report references specific thresholds for indicators using absolute values which results in identifying patients at risk for substance use disorder or overdose, whether or not that is true. It should be noted that not all individuals who breach the threshold are at risk for substance use disorder or overdose and those below the threshold may still be at risk. Therefore, interpretation of these measures are limited due to the lack of contextual information regarding the prescriptions. A more comprehensive approach and complete evaluation of the economic, environmental and societal influences is necessary to appropriately interpret PDMP data and put the opioid epidemic into context. Hospitalization and emergency department data are obtained through medical billing codes, which vary in their completeness. These records may not provide all information regarding the specific drug or drugs that were associated with a non-fatal overdose. Further, the required billing codes for hospitalization and emergency department visits changed in 2015, and as CDPHE continues to refine the case definitions with the new coding scheme, only 2012-2014 data were used in these analyses. These data represent health care encounters, not individuals. Lastly, limitations of death certificate data may result in reporting bias. Deaths reported as multi-drug toxicity lack the specificity to know exactly what substance caused death. CDPHE does not collect toxicology reports for unintentional overdose deaths and therefore cannot determine whether drugs that were not indicated on the certificate represent negative test results or whether the drug was not part of the testing. The PDMP is a critical tool in the fight to protect health and safety of Coloradans while supporting clinical practice. Although use of the PDMP is not mandatory for prescribers, in 2014 Colorado physicians queried 414,549 patient records. In 2016, the number of queries increased 64 percent to 681,348, demonstrating the value of the PDMP as a clinical decision making tool. Prescription drug misuse is a public health crisis and the PDMP is one tool that can be used to evaluate initiatives designed to change patient and provider behavior to reduce prescription drug misuse and the associated adverse health outcomes. However, the misuse of prescription drugs is a multidimensional problem. A balanced approach to this work includes an understanding of the need to preserve access to medications for the management of care and meeting patient expectations while decreasing the misuse and diversion of controlled substances. 1. Health Information Designs (HID), LLC. Colorado Prescription Monitoring Program. http://www.hidesigns.com/copdmp Accessed January 19, 2016. 2. Clark T, Eadie J, Knue P, Kreiner P, Strickler G. Prescription drug monitoring programs: an assessment of the evidence for best practices. Boston, Massachusetts: PDMP Center of Excellence, 2012.
http://www.pewtrusts.org/~/media/assets/0001/pdmp_update_1312013.pdf Accessed January 19, 2016. 4. Dowell D, Haegerich TM, Chou R. CDC guideline for prescribing opioids for chronic pain - United States, 2016. MMWR Recomm Rep. 2016; 65(No. RR-1):1-49. DOI: http://dx.doi.org/10.15585/mmwr.rr6501e1. 5. Prescription Drug Monitoring Program- Training and Technical Assistance Center (PDMP TTAC). Morphine Milligram Equivalents Calculator. http://www.pdmpassist.org/pdf/bja_performance_measure_aid_mme_conversion_tool.pdf Published May 1, 2013. Accessed January 19, 2016. 6. Colorado Department of Regulatory Agencies (DORA). Policy for Prescribing and Dispensing Opioids. https://www.colorado.gov/pacific/dora/PDMP_News Accessed January 19, 2016. 7. Substance Abuse and Mental Health Surveillance Administration (SAMHSA). The Drug Abuse Warning Network (DAWN): Benzodiazepines in Combination with Opioid Pain Relievers of Alcohol: Greater Risk of more Serious ED Visit Outcomes. 2014. 8. Rosenthal A, Bol K, Gabella B. Examining opioid and heroin-related drug overdose in Colorado. Health Watch. 2016; 100. http://www.chd.dphe.state.co.us/Resources/pubs/Colorado-Opioid-and-Heroin-Overdose.pdf Accessed December 2, 2016. 9. Take Meds Seriously. The Problem: Colorado Statistics. http://takemedsseriously.org/the-problem/coloradostatistics/ Accessed January 19, 2016. 10. Colorado Consortium of Prescription Drug Abuse Prevention. Heroin In Colorado: Preliminary Assessment. 2017.